The Saint John Regional Hospital is the largest facility in New Brunswick and serves a population of 200,000 in the southern part of the province. A flagship hospital, we have 23 areas of specialty medicine and surgery, and are supported by a vast array of research, education, health promotion activities and community partnerships. As a designated campus of the Dalhousie University Medical Education Program and through its affiliation with Memorial University of Newfoundland, the Department of Emergency Medicine shares academic responsibilities for CCFP (EM) and FRCP (EM) residency training programs, post graduate residents and medical students with regular teaching, rounds and journal clubs. 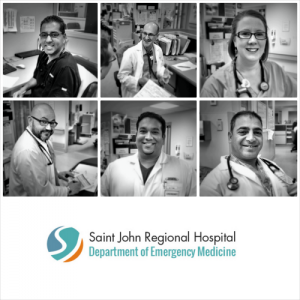 The Department of Emergency Medicine has close academic links with Dalhousie Medicine New Brunswick (DMNB) whose Saint John campus is conveniently co-located with the University of New Brunswick and the Saint John Regional Hospital. The Department of Emergency Medicine is based in a purpose built state of the art facility that was opened in 2010, with a trauma and critical care, acute monitored care and urgent care area, simulation lab, and ultrasound teaching lab. Our Emergency Department serves approximately 55,000 patient visits per year including primary, secondary and tertiary emergency medicine and Level One trauma program referrals. We are supported by the New Brunswick Heart Program and cardiac catheterization lab, as well as our interventional radiology program and neurosurgical unit. We are staffed by a team of professionals who believe in a culture of trust, ownership and caring and who work hard to provide high quality clinical care, research and medical education. And to top it all we are surrounded by nature at its best. Imagine a playground in Atlantic Canada fringed by fresh waterways on one side and the ocean on the other. 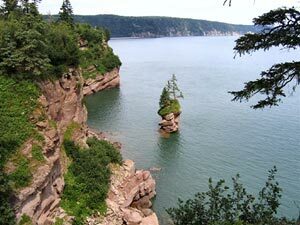 Saint John is situated in the picturesque Bay of Fundy and is located on one of the finest inland waterways in North America. Saint John offers numerous social and cultural facilities as well as recreational opportunities including boating, yachting, winter sports, golf and fishing. Being the only official bilingual province, there is access to both English and French school systems.